Ready for Action. Built to Last. Warfighter Safety, Productivity Enhanced with the Newly Designed Combat Radio. Warfighters depend on every word being heard and every command being received, both on base and in the field. 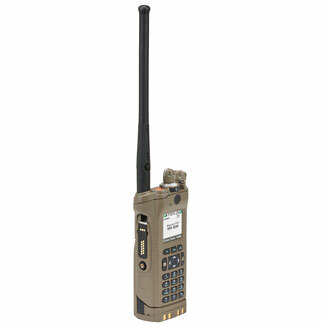 With a rugged “grab-and-go” form factor, the SRX2200 Combat Radio delivers it all. Designed to meet MIL-STD tests, the SRX2200 exceeds IP67 ratings for dust and water protection and can be submerged without damage or degradation. Full tactical and data capabilities support the mission wherever soldiers operate – providing secure encrypted voice communications between a leader and the squad. Delivering safety features such as Individual Location Information (ILI), radio-to-radio text messaging, tactical radio inhibit and night vision goggle compatibility, the SRX2200 equips soldiers for the mission ahead. Battle-tested and military-trusted, the Motorola SRX2200 Combat Radio is built on secure, reliable COTS solutions that are proven tough in the harshest environments. The SRX2200 is backward and forward compatible with all Motorola mission-critical radio systems, including the latest Project 25 (P25) standards for interoperability. Full tactical and data capabilities support the mission wherever war fighters operate – in new geography, challenging topography or areas without networks. With an 80 dB receiver, the SRX2200 has greater coverage and improved audio quality compared to other radios in its class. FIPS 140-2 Level 3 validated encryption capability for secure voice and data communications – the SRX2200 is compliant with Department of Defense standards for APCO waveforms and encryption and meets Federal Information Processing Standard (FIPS) 140-2 Level 3 security, allowing for deployment in the most sensitive operations. Combining Motorola’s experience with AN/PRC 153 and P25 standard-compliant portables, the SRX2200 can be deployed without additional spectrum or infrastructure. With P25 compatibility, war fighters can rely on the same SRX2200 radio when they return to base system, saving the additional training, maintenance or logistical costs that are incurred when supporting multiple radios. The SRX2200 delivers a full suite of communications-ready features and applications, such as secure encrypted voice and text messaging and over the air programming (OTAP), and individual location information (ILI). The SRX2200 exceeds the IP67 submersion specification and can be submerged in two meters of water for two hours. It also meets the rigorous MIL 810 specifications. The multi-unit charger enables rapid charging of the radio at higher temperatures, including desert conditions.